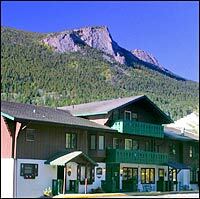 We list all of the Estes Park area Motels & Hotels that directly serve Rocky Mountain National Park. If you know of any motel or hotel that we do not have listed, please contact us. NOTE: Listings in the "Display Ad" section of this page are in a alaphebetical order with a random starting point. This means when you visit this page in the future, you will see the list start with a different lodge. "Found them on the EstesPark.USTM Site." 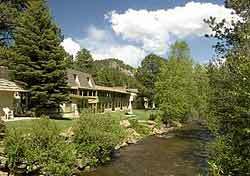 Welcome to the 4 Seasons Inn on the Fall River in Estes Park. Nestled in the towering trees, the 4 Seasons Inn provides some of the most relaxing and romantic Estes Park lodging available to couples. We have a spacious deck with hot tub and seating that looks over the river as it passes through our property. There are also picnic and grilling areas for guest use. Located 1 mile from downtown and 2 miles from the entrance to the Rocky Mountain National Park, the 4 Seasons Inn is open year round and has specials during the “Off Peak Season”. Families love 2 Eagles Resort located on the beautiful Big Thompson River because of the many activities for all to enjoy. Fishing, hiking, and wildlife viewing are just a few. Our prices are still some of the most affordable in the area. Spacious units for one to six people with private baths and fully equipped kitchens. Gas fireplaces are available in some units. Enjoy our campfire sing-a-longs, kid's play set and sandbox area, indoor and outdoor games, horseshoe pit and lots of lawn area to play and relax by the river. Exceptionally clean, comfortable rooms, heated outdoor pool, beautiful views of the mountains, hiking, relaxing, and friendly, hospitable hosts are just some of what you'll experience here with your vacation. We're located on the west end of town, on US 36, near Rocky Mountain National Park and the YMCA. A summer property, we're open May 1 through October 7, but we are available to take reservations throughout the whole year. Our goal is to help make your vacation stay very memorable, from providing excellent lodging value to personalized care and information. We invite you to relax by our aspen-shaded heated outdoor pool, and to also experience the excellent food at the Sundeck Restaurant. Free wireless high-speed Internet access in all rooms, business center in office with cable high-speed access plus computer and printer. Come enjoy the convenient, friendly atmosphere of our Mountain Inn. We have five star hotel queen and king beds, Satellite TV, refrigerators and air conditioning in every room. 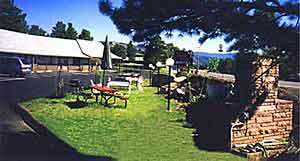 Deer Crest Resort is the perfect mountain getaway for the discriminating traveler seeking quality lodging at affordable prices. Deer Crest is located on the beautiful Fall River. To make your stay more comfortable, Deer Crest is an Adults Only non-smoking property. We offer a variety of lodging from rooms to mini suites with kitchenettes and fireplaces. Refrigerators, microwaves and coffee makers are available in all rooms. Enjoy our indoor hot tub with windows overlooking the Fall River. Fish, watch the wildlife, or just listen to the sounds of the river. Free Wifi and DVD's to borrow. Firepit for your enjoyment. 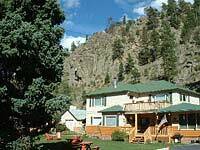 Deer Crest Resort is located just 1 mile west of downtown Estes Park and just 2 miles from the entrance to Rocky Mountain National Park. We are open all year. Come enjoy all the seasons of Deer Crest. Della Terra's mountain cabins are located above Estes Park at the Fall River entrance to the Rocky Mountain National Park. 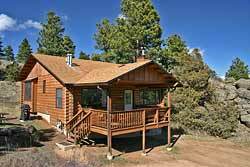 Scattered on the mountainside and surrounded by untouched nature, overlooking the southern valley and the western continental divide across a sea of pines, tucked below the granite cliffs. Our cozy cabins feature log siding, wood burning fireplaces, hot tubs, full-sized kitchens and baths, cable TV, and VCR or DVD players. We also have motel units with kitchens or mini-refrigerators and microwaves, private decks, cable TV, and access to a central hot tub. Units have a variety of floorplans, including open, 1 bedroom and 3 bedroom. Enjoy your Rocky Mountain vacation at The Discovery Lodge, the closest accomodation to downtown Estes Park on Hwy 34 East; just minuets from the Rocky Mountain National Park. Our 5 Acre wooded, grass landscaped grounds offer magnificent views of the surrounding mountains, adjacent golf course and beautiful Lake Estes. Excellent housekeeping and a friendly staff awaits your arrival. AAA 3 Diamond award. Estes Village inn is committed to providing a clean, comfortable and friendly place to stay while on vacation. Rooms have 25 inch color cable TV and direct dial telephones. Some rooms with private balcony. Seasonal heated outdoor pool and hot-tub. We are located less that 1/2 mile from the town of Estes Park and 5 miles from Rocky Mountain National Park. Near by activities include shopping, dining, horseback riding, GoKarts, theatres and the Lake Estes Marina. Children stay free. Non-smoking rooms available. Fawn Valley Inn is located just one mile from Rocky Mountain National Park with spectacular mountain views, excellent wildlife watching, and trout fishing right on our property. Many of our units are newly-remodeled with luxurious appointments. Choose from our one- and two-bedroom condos, Jacuzzi and hot tub suites, or a cozy cabin for two on the river. All units have a full kitchen (or kitchenette), fireplace, cable TV and DVD player (with free movie library), and, best of all, decks and patios overlooking Fall River and Deer Mountain. Enjoy our outdoor heated pool and hot tub. We welcome family reunions and large wedding parties. Be sure to ask about our winter specials! 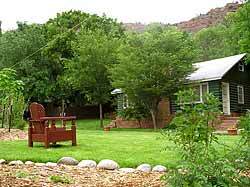 Nestled below Colorado�s radiant mountaintops is beautiful Lazy R Cottages. Just one mile from Rocky Mountain National Park, our one, two, and three-bedroom cabins are perfect for romantic escapes and family vacations. Rustic elegance is how we describe our cabins and cottages, which range from 290 to 1100 square feet, and accommodate from two to twelve people. We also offer cabins with personal hot tubs ... perfect for relaxing after a day enjoying Estes Park and Rocky Mountain National Park. Families will enjoy our picnic tables and playground, with scenic hiking trails and endless fishing waters just minutes away. Pets are welcome with approval. We are open all year. Be sure to ask about our winter specials! Imagine spending your vacation Fishing, Hiking, having a Picnic or taking a stroll down our Beautiful Flagstone River Walk. With over 1200 feet of River to enjoy. Most all of our Cottages have very nice decks that overlook or are right on the Big Thompson River. If our 22 acres are not enough for you, we are just 6 miles from the entrance to Rocky Mountain National Park. To get to the Park you must pass right through the town of Estes Park. You can have a wonderful time stoping to shop on your way to the Park. We will be glad to recommend a fine choice of excellant Restaurants. Come enjoy a romantic weekend away at McGregor! We are nestled on the slopes of McGregor Mountain with panoramic views of the Continental Divide, Deer Mountain and Sundance Mountain. Being only one-half mile from the Fall River entrance to Rocky Mountain National Park, our property offers easy access to over 350 miles of hiking trails. We are bordered on the North by the National Park, so wildlife, including Bighorn Sheep, Elk, Mule Deer and many others, are common sights throughout the year. While being located in the natural beauty of the area, we are also only four and a half miles from the conveniences of downtown Estes Park where many shops, restaurants, and other attractions adorn our quaint mountain village. Spend a day in the park or in town and come “home” to relax by your own crackling fire while taking in the great views! Our cabins, suites and rooms are furnished in keeping with the surrounding mountains and habitat. Solid pine furniture, natural and rustic accents, and pictures of native flowers and wildlife reflect our casual high country setting. We are known for our outstanding views and the cleanliness of our accommodations. Come be our guest! Misty Mountain Lodge offers the best of both worlds. 2 miles to the National Park, 2 minutes walk to everything downtown. We have rooms, suites and cabins. Every single unit is different! The back of our property is Little Prospect Mountain, and the Big Thompson River is right across our lane. If you cross the bridge in front of our place, you can follow the Riverwalk about a block down to the River Plaza (at the confluence of the Big Thompson and Fall Rivers) on the back side of downtown Estes Park. With 60+ spruce trees in the yard, water features, decks, hot tubs, gas grills, picnic tables, swings, and Adirondack chairs, its just a lovely place to hang out! We have wireless internet available, plus an internet station in the office for your use. Each unit has cable TV with HBO and direct-dial phones. Most have full kitchens, many come with fireplaces. Groups welcome. 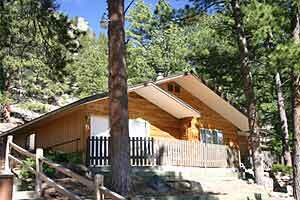 Nicky's Resort is a premier resort property in beautiful Estes Park, Colorado. Nicky's Resort has been a landmark since 1964. Come visit for the first time or revisit the Nicky's Resort and see all the changes. This pristine property offers lodge rooms, cabins, river units, fireplaces, an outdoor heated pool (in season and is located along a breathtaking stretch of the Fall River. Catch a Rainbow Trout right off the deck of Nicky's Resort lobby. River is always stocked for our guests in the summer. Nicky's Resort is located 1 mile west of Estes Park and 2 miles from the north entrance of the Rocky Mountain National Park. Nicky's Steakhouse, located on site of the property, offers extensive menus for your dining pleasure. Saddle & Surrey Motel is the friendly place to escape daily pressures of life. Excellent vacation get-a-way for families, couples and singles. We are a family owned and operated. We take pride in providing you with clean and comfortable accommodations at reasonable rates with an outdoor pool and spa to relax in the summer. All rooms are non-smoking, pet-free and are air conditioned. Our larger units have fully equipped kitchenettes. We are located 1 1/2 mile from downtown Estes Park, 5 miles from Rocky Mountain National Park and 1 block from the 18-hole golf course. Consider Stone Mountain Lodge and Cabins for your Colorado Wedding, Reunion in the Mountains or Romantic Getaway on our scenic 45 acres. Our family-friendly Resort near Estes, Boulder and Rocky Mountain National Park is convenient for all. And nearby Lyons has great restaurants, shops, music festivals and concerts. Year-round lodgings include a historic, romantic 2 bedroom cabin with jetted tub and gas fireplace, one bedroom and studio cabins and nicely decorated lodge rooms. All non-smoking units have refrigerator, microwave, coffeemaker, phone, cable TV and are air-conditioned. Our picturesque pond-side location beneath towering red cliffs is a great setting for Weddings, Reunions and other Group Events. Our friendly staff will assist to make your event special and handle your guests' lodging needs (ask about Group Lodging Discounts). Relax at our duck pond and pool (summers), take those special photographs, enjoy a hike. Please visit! Experience the beauty of Rocky Mountain National Park from your front porch or hot tub! Timber Creek Chalets provides the perfect setting for comfort and relaxation. Following a day of shopping or hiking in the park, refresh yourself in our outdoor heated pool (seasonal), or perhaps just soak in our year-round hot tub. Our chalets sleep from two to ten people � some with personal hot tubs � and are ideal for romantic getaways or family reunions. All units have kitchens or kitchenettes, fireplaces, cable TV with DVD players, free Wi-Fi and private patios with gas grills. Enjoy a game of pool in our lodge room. Pets are welcome in selected units and we are open all year. We�re only two miles from Rocky Mountain National Park. Be sure to ask about our winter specials. Hike From Your Front Door! Stonebrook on Fall River is proud to offer you the choice of Motel Rooms, Cozy Cottages or our Luxury River Suites with in room Spas. Enjoy Fishing, Hiking, Wildlife Viewing and the soothing sound of Fall River as it makes its way through Trails West. Take a dip in the outdoor hot tub after you enjoy a day experiencing Rocky Mountain National Park. Our Cottages and River Suites feature Fireplaces, Kitchens, and Decks that overlook Fall River. Conveniently located between downtown Estes Park and the entrance of Rocky Mountain National Park on the Fall River, you will find Restaurants, Horseback riding, Shopping and Family Entertainment all within a 5 minutes drive. Please visit our website for more information on our property. We invite you to stay at Trails West in Estes Park during your next family vacation or romantic getaway, your hosts Jeff & Kris. Newly re-modeled rooms with a panoramic view of the Rocky Mountains. All rooms have tub & shower combination, cable TV and ceiling fans. Two special rooms have a spas and king size beds. We have 1, 2 and 3 bed units with double, queen and king size beds. Seasonable outdoor heated pool and hot tub. We are centrally located at the intersections of Highway 7 and US 36, just east of down town Estes Park within a short walking distance to shopping and dining in Estes Park. Lake Estes trail starts directly across from lodge. We have the best view of the 4th of July Fireworks. Ideal location for those attending events at Stanley Park Fairgrounds. Open all year with reduced rates during the "Value" and "Winter" seasons. Treat yourself to one of our upscale spacious mountainside rooms adjacent to the Rocky Mountain National Park. Most rooms feature the Deluxe Tempur-Pedic mattresses for the best night�s sleep you have had in a long time. All rooms have queen beds with luxurious 310 thread count linens, microwaves, refrigerators, private decks, CCTV's, VCR/DVD players, Phones, and BBQ's. Some rooms have steam baths and fireplaces. Reserve private time in our beautiful sun room where you will enjoy the flicker of the fireplace while soaking in the hot tub, or book a body treatment at our Day Spa. Free High Speed Wireless Internet in all on-property units as well as at the computer station in the lobby. = Your pet(s) welcomemay be an additional charge. All properties listed that are pet friendly had rooms or units that are pet friendly. NOT ALL ROOMS OR UNITS ARE PET FRIENDLY, so when you book your vacation, do let them know that you are brining a well behaved pet. 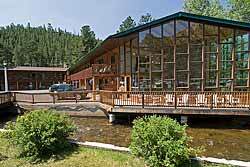 Nestled amongest towering Ponderosa pines, the 4 Seasons Inn provides romantic getaways for couples. Most units with fireplaces and some with private outdoor hot tubs. Independent family motel, immaculately clean, highly rated on TripAdvisor.com, friendly hospitality, hiking informaton. Affordable rates. Ground level convince with parking by your room door. Close to everything — Close to perfect. 75 rooms situated on 5 acres. Just one mile to downtown and 2 blocks to Lake Estes. If you were any closer, you would be in the park. Outdoor pool and hot tub with excellent view of the Rocky Mountains. 1/4 mile from downtown Estes Park. Wildlife watching at its best! Beautifully-remodeled condos and suites sleep from two to ten. Only one mile to RMNP. 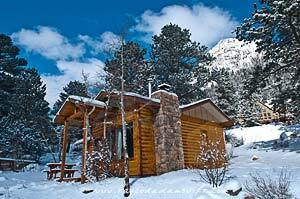 Mountain Cabin rentals don't get any better than Lazy R Cabins: incredible views, wildlife, fireplaces and hot tubs. 17 Beautiful River Cottages to fit your every need. We can take care of singles, families or Family Reunions. McGregor Mountain Lodge offers clean and comfortable cabins bordering Rocky Mountain National Park with panoramic views of the Continental Divide. Come be our guest! Misty Mountain Lodge offers the best of both worlds. 2 miles to the National Park, 2 minutes walk to everything downtown. Quality Lodging at Affordable Prices! Super clean rooms and an outdoor pool and spa for you to enjoy in the summer. Situated on 45 private acres overlooking Apple Valley with mountain views and wildlife. Beautiful cabins in the forest! Only four minutes to town and two minutes to Rocky Mountain National Park. 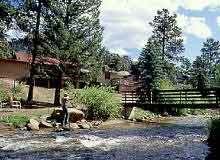 Motel rooms, cozy cottage, and luxury Spa Suites located on the beautiful Fall River in Estes Park. 48 Guest Rooms with outdoor pool and hot tub within walking distance of downtown Estes Park. Wildlife Viewing at its Best! Copyright ©1999- EstesPark.US, Users may download and print extracts of content from this website for their own personal and non-commercial use only. Republication or redistribution of EstesPark.US content, including by framing or similar means, is expressly prohibited without the prior written consent of the owner.